Deep-fried crab claws in salt and pepper (椒鹽鮮蟹拑) - not what I had expected, as there was a reasonable amount of batter here. Very tasty, though... both the batter as well as the crab meat itself. I did find a few small pieces of the shell in the batter. 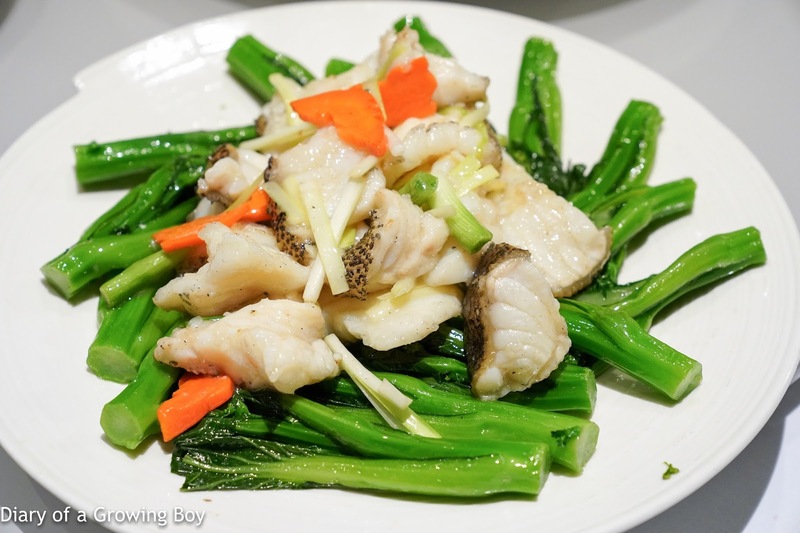 Wild brown-marbled grouper two ways: stir-fried fillets with vegetables (黃皮海虎斑兩味：菜遠炒球) - I always think that stir-frying a premium fish is a waste, but restaurants keep serving them up. I do have to say, though, that this was pretty decent. The thick slices of grouper were still pretty tender. 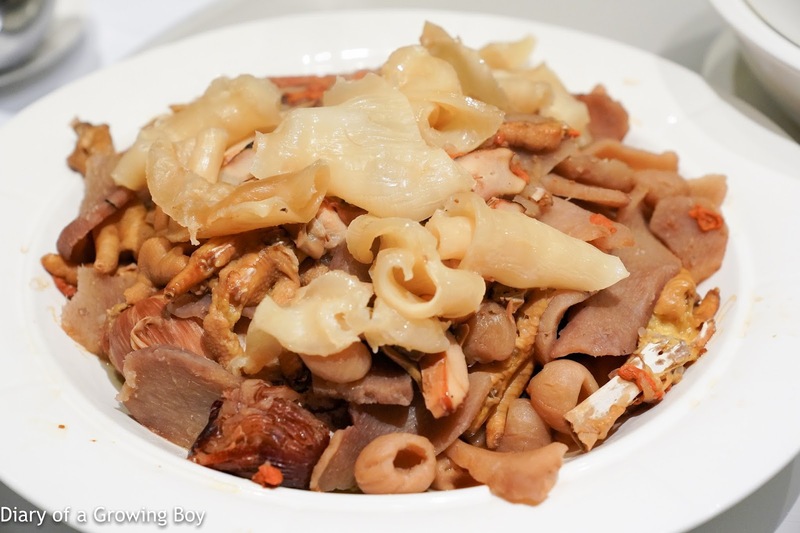 Stir-fried vegetables with dried conpoy and bamboo piths (瑤柱竹笙扒翡翠) - this was very, very good. 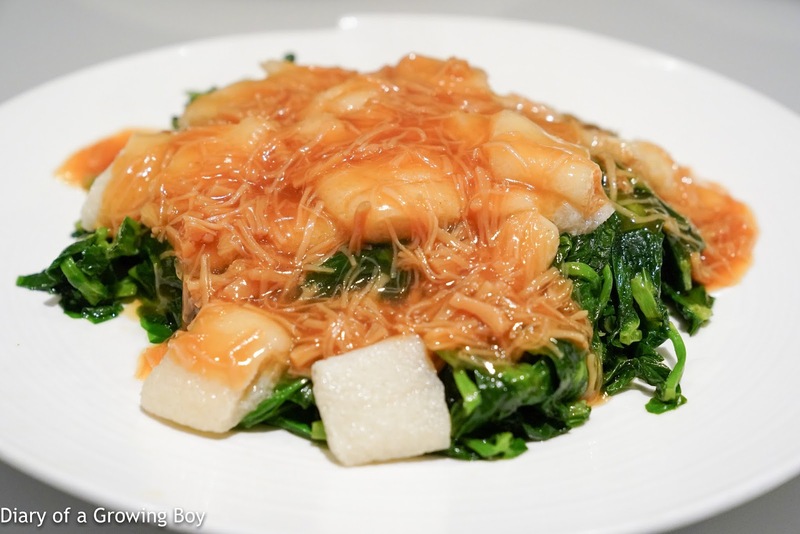 The pea shoots were delicious, as was the conpoy thickened with starch. One of the highlights tonight. 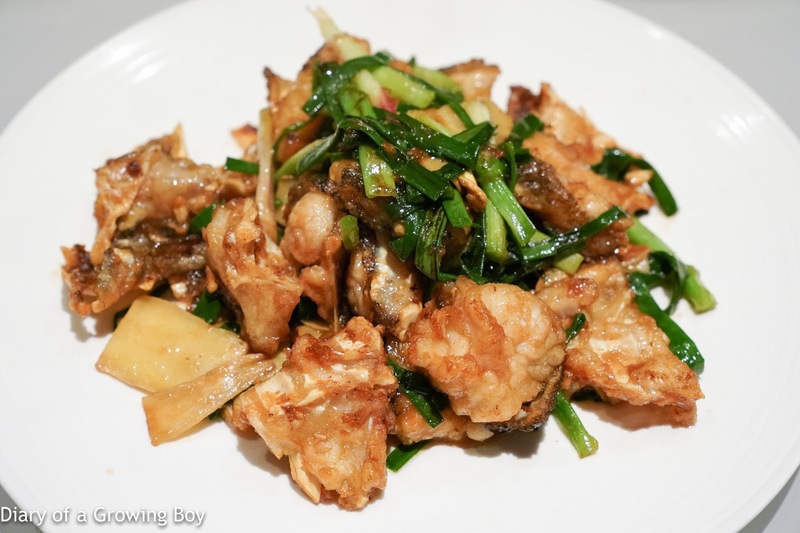 Wild brown-marbled grouper two ways: stir-fried head with ginger and spring onion (黃皮海虎斑兩味：薑蔥頭腩) - from my last visit, I knew this place does a pretty good job with frying fish heads, and they did not disappoint tonight. Very satisfying to try to get inside every nook and cranny to get at the meat and gelatin. Pan-fried king prawns with soy sauce (豉油皇香煎大蝦) - I rejected the restaurant's initial suggestion for crystal king prawns, since they were pretty disappointing last time. 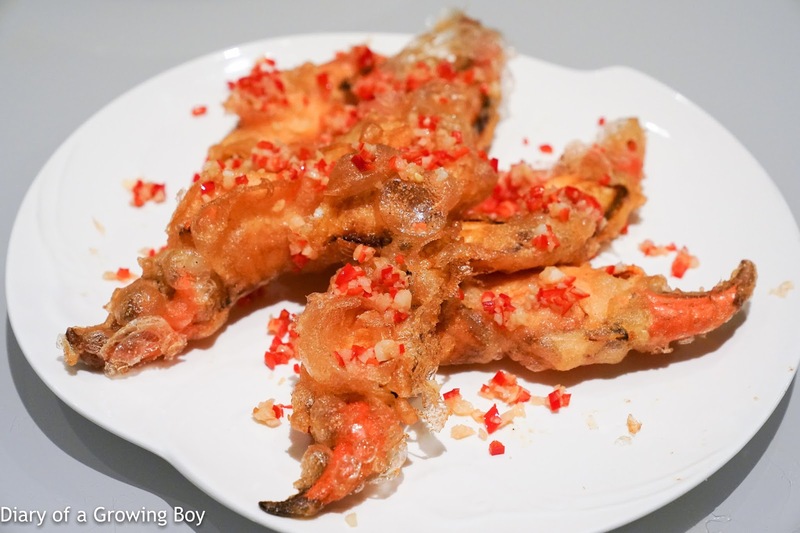 These pan-fried prawns - with shells on and seasoned with soy sauce - were better. At least the flavors from the soy sauce was good. 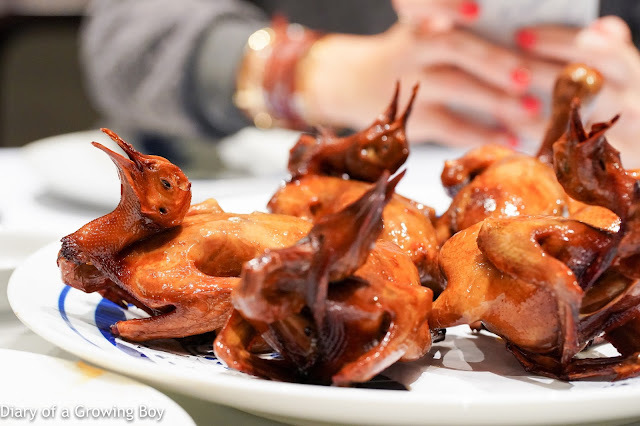 Crispy young pigeon (紅燒脆皮妙齡鴿) - now THIS was arguably reason enough alone to come here. The pigeon was the one dish that I remembered vividly from last time, and it was the one dish I really, really looked forward to tonight. And it was fantastic! Just as good as I remembered from last year. So, so, milky! 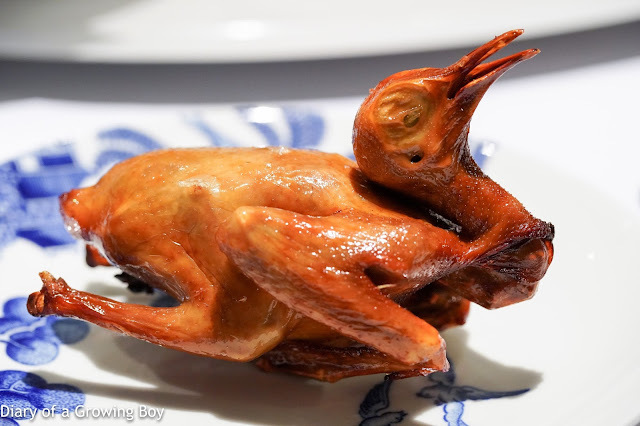 For a bird that doesn't feed on milk, it always amazes me how much this tastes like a mammal that was still suckling on its mama's teat. So, soooo juicy and succulent. 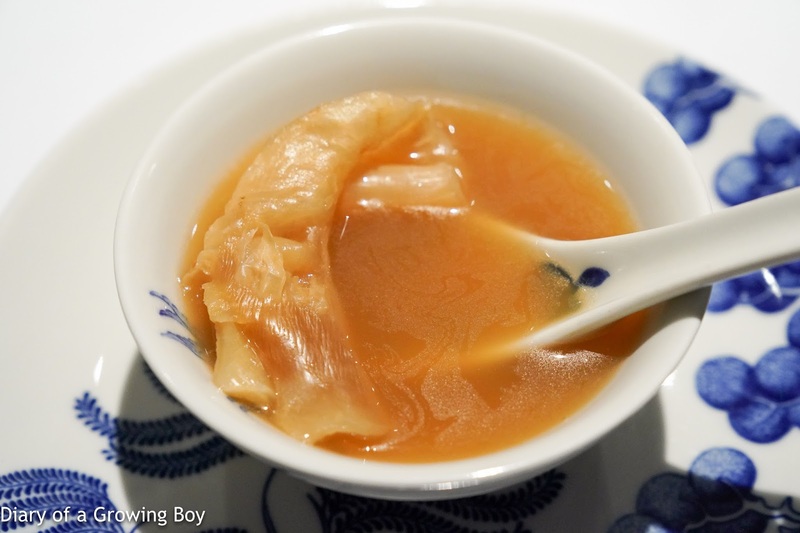 The skin, of course, was beautifully crispy - having been marinated in 20-year-old master stock (滷水). My friend made sure to order extra, and I very reluctantly had a second bird... after The Great One turned it down. 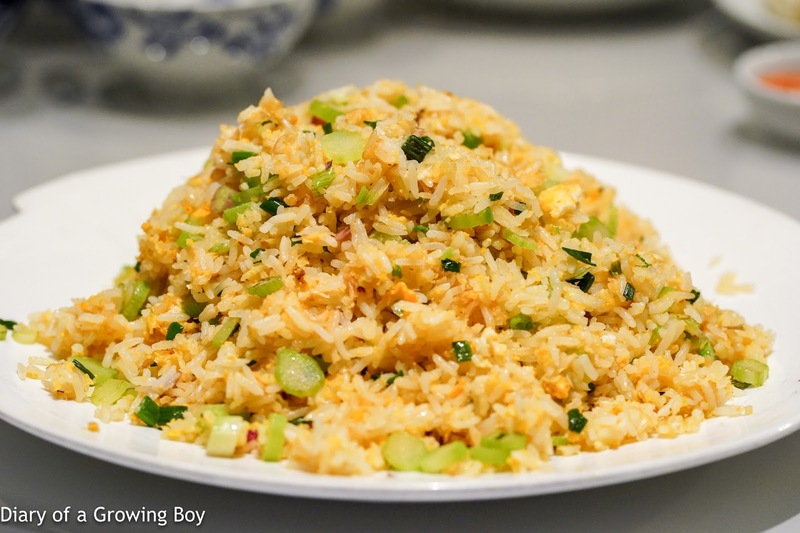 Fried rice with dried conpoy and ginger (瑤柱薑粒炒飯) - I didn't care for this. There was simply too much ginger which overpowered everything. And I was already pretty full by this point. 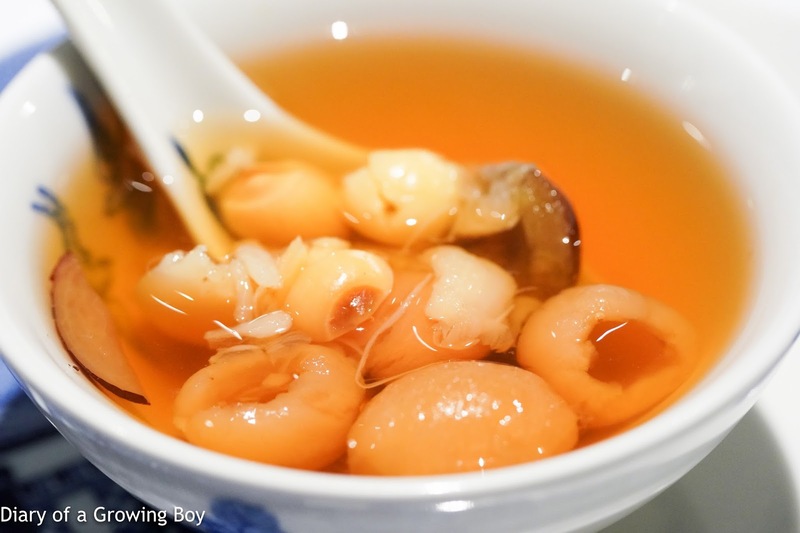 Jujube soup with lotus seeds, lily bulb, and longan (紅棗蓮子百合圓肉糖水) - not bad, but I was so stuffed at this point. We were pretty good tonight and only popped open two bottles. 1997 Clarendon Hills Astralis - served 1 hour after opening. Smoky, stewed fruit, with some sweetness in the nose. Some acidity here. After 1½ hours the nose became more Aussie, with more sweet fruit and tropical notes. 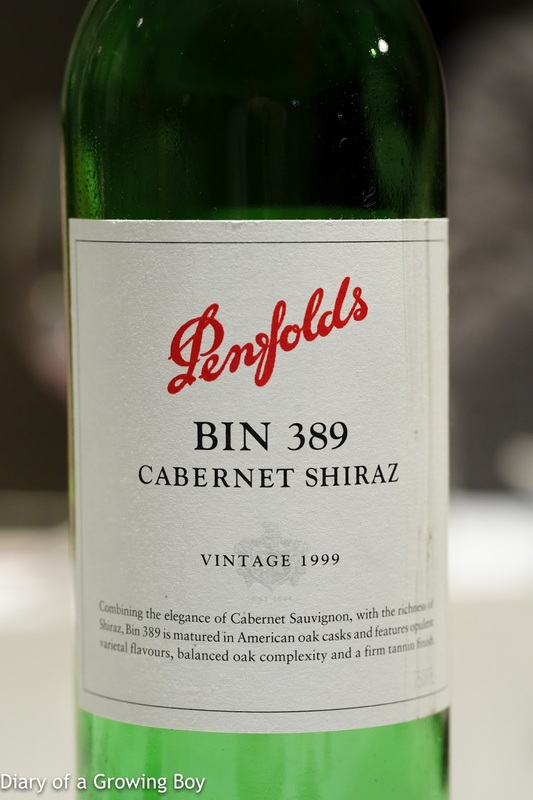 1999 Penfolds Bin 389 - very coconut and sweet nose, classic Aussie. $6000 per table for those type of dishes is a complete rip off.